Welcome to the 2nd Annual Santa's Coming to Town Giveaway Hop hosted by Karen’s Got Mail & Capturing the Moment! I have teamed up with a fantastic group of bloggers to share some awesome giveaways with our readers. Be sure to hop around to the participating blogs listed below and enter some fabulous giveaways, all of which are worth a minimum of $25! Confession: I really don't like shopping for my husband! Don't get me wrong, it's not that I don't like spoiling him or anything like that...I do! I just never know what to get him! Mostly, he's the type of person who if he wants something, he jut gets it. If he doesn't, that typically means its out of my budget anyway. That makes it really tough to shop for something he loves but doesn't always have. Here at SnorgTees, we specialize in pop-culture inspired, random, and all around funny t-shirt designs. We started this company in 2004 out of our basement, and faked everybody into thinking that we own an actual business. We've even shipped a shirt to NASA. That means space. So, technically, we're a universal company. As I said, I was first introduced through their children's tees that were perfect for my nerdy son... but I must admit, my husband's a bit of nerd too. He loves clever tees showing off some of his favorite fandoms too. I knew Snorg Tees would be a great fit, so I went back to find just the right tee for his list. 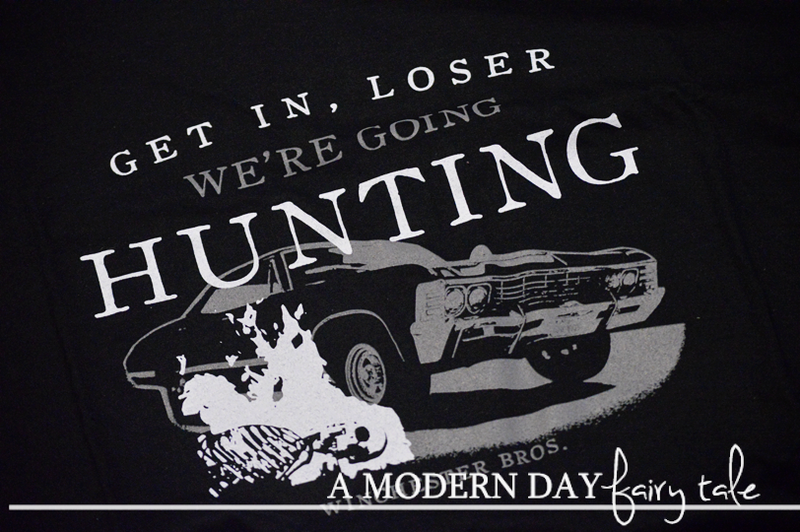 I found that in their 'We're Going Hunting' tee. 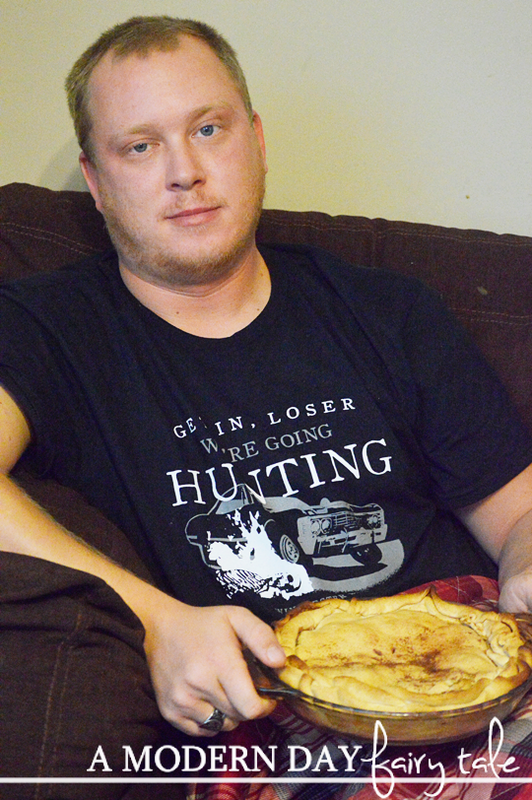 Now, here's something you might not know about my husband and I--- we LOVE Supernatural. We often joke that despite our many, many differences (we're polar opposites in fact), Supernatural is our one common ground. Several times throughout the year, we find ourselves once again binge watching the series all the way through. We even say that our song is Carry On My Wayward Son for this very reason. Needless to say, it's a big deal in our family. So when I saw this shirt, I knew it was a must for him. It even featured one of his favorite characters...'Baby'! (For you non-fans, that's the car!) And I was right, he loved it! Winner will be contacted via e-mail after giveaway ends, and will have 48 hours to respond before a new winner is chosen. One entry per household, winning entry will be verified. Odds of winning depend on valid entries received. A Modern Day Fairy Tale is not responsible for prize delivery. Disclosure: Karen’s Got Mail, Capturing the Moment and the Santa's Coming to Town Giveaway Hop participating bloggers are not responsible for sponsors who do not fulfill their prize obligations. Facebook, Twitter, Pinterest and any other social media are not affiliated with this giveaway. The guys in my family like getting tshirts for gifts. My husband can be hard to shop for too. I think he would really like one of the fun shirts from Snorg, though. I have several people that would enjoy one of these tees!!!! I am sure hubby would love one of these tees. Oh just so you know I accidentally put the wrong link into the giveaway, on the do another giveaway, which I am entering on the tennessee-christmas-with-amygrant contest. sorry.. Yay!! I love Snorg tees!! They make perfect holiday gifts! !Some of they are SO FUNNY!! But all of them are fabulous! I love Snorg Tees! They have some great shirts! I would love to get one of these as a surprise gift for my hubby for Christmas! My brother loves unique t-shirts, so this is a great gift idea for him. Thank you for the chance to win! These look awesome! I know more than one person on my list that would love them! I absolutely love silly tshirts like this i have the most amazing collection and would love to add to it! I entered the wrong magic word!!! tuesdays is Tiara! i'm so sorry! There are so many awesome ones!! Unicork is a favorite! The Count Dabula shirt is hilarious! i love the 'Type 40 TARDIS' design! So many shirts that I want for myself and for gifts for my husband and brother. I think my current favorite is the Mordor Fun Run because I recently started running (ran my first half last month) and I am a huge LOTR fan (as in I still have movie marathons!). My husband would love the tee that your guy is wearing. He'd also like the Commas Save Lives! shirt. Thanks.